A Limited Edition Manuscript of Water Empowerment for Life is now available for a limited time only. David Wheeler’s book about the healing power of water will totally revolutionize society’s understanding of not only healthcare but also about what is accepted as real based on empirical mechanism. Read for yourself why you should get this book as soon as possible. You can free your self from the medical model as well as the pervasive confusion that dominates alternative health care. This book about the healing power of water will provide the direct means to realize abundant health, extend life and truly enjoy every moment while alive on the planet. The limited edition manuscript of Water Empowerment for Life is in an eight and a half inch by eleven inch format, with a color front and back cover as well as several photographs and illustrations in color. Each copy is signed, dated and numbered. Water Empowerment for Life will become the standard for understanding the healing power of water as well as what humanity needs to do in order to survive as a species. Once the book itself goes into production the limited edition manuscript edition will no longer be available. 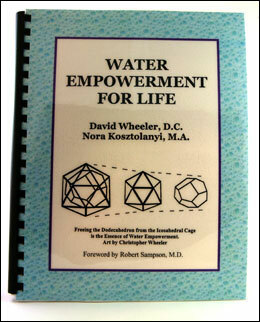 Become one of the lucky people to obtain the limited edition manuscript version of Water Empowerment for Life. A person will learn how change their life and the lives other simply based on the kind of water they drink. The price for the limited edition manuscript edition of Water Empowerment for Life is $33.00 plus shipping charges. Shipping the book by either parcel post or priority mail is OK inside the United States. International shipments should go by International Express in order to make sure the book arrives in a reasonable period of time. There is one standard shipping rate in the United States by US Postal Service for the book by parcel post, which is $5.00. All other rates for domestic and international orders will be calculated based on the speed of shipping and the destination. You can order online, by telephone or fax with a credit card. For orders by check secure US funds are required as a money order or cashier’s check. Click Here to find out about all shipping methods. M-Water® is presented in Water Empowerment for Life as the name for ordinary water transformed into Perfect Living Water with the technology I invented (the M-Power Aqua Technology!"). Click Here to order Water Empowerment for Life online at the shopping cart. Dr. David Wheeler was born in the very small town of Glasgow, Montana. After Dr. Wheeler’s family moved to the Seattle area for a few years they eventually made there permanent home in Oregon, where his mother still resides in the same house to this day in the Portland area. Dr. Wheeler served in Vietnam and is a decorated veteran. After discharge from the Army he completed his undergraduate education at both Portland State University and Southern Oregon University. After completing undergraduate studies he then attended Western States Chiropractic College in Portland, Oregon – which is the second oldest Chiropractic College in the United States. He graduated in 1982 and received his Oregon licensing in early 1983. After a few years of practice Dr. Wheeler applied for and received licensing in New York and Colorado. In the middle 1990s Dr. Wheeler lived and practiced full time in New York City (Manhattan), with the focus of his practice being to work with patients with serious chronic disease from an alternative healthcare perspective. Prior to moving to Manhattan in order to establish a practice Dr. Wheeler developed health issues and could not work for several months. After successfully taking care of these health issues that interfered with his being able to work Dr Wheeler started a company to research and develop highly effective natural products and methods. Dr. Wheeler moved his new company to Oregon in 1996 to be near his family. At that time Dr. Wheeler time discontinued practicing full time in order to dedicate his life to research and development.